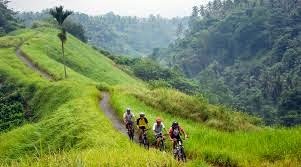 Bali Cycling tour is the suitable activity to explore the nature with island adventure and having a fun vocation attraction. Supported by international standard fixtures and fittings, with a high level of security as well as services of experienced cycling guides, cycling may be one of main travel options to feel the nature of Bali island during your holiday. Kintamani are attractions that have cold air with beautiful scenery. In the course of the decline so as not to spend energy to ride a bike, we will go through the various views of the mountains, rice fields, housing is still very traditional and we will find a place of historic relics. This tour will finish in Ubud. The natural beauty of Bali located throughout the Village Carang Sari that has beautiful countryside scenery countryside and very amazing are no less interesting than the other Bali attractions. Carang Sari village one village in Bali is a favorite place for a cycling trip in Bali. While bush walking village in the morning and see the beauty of nature in the morning will give freshness and coolness, and more fun. 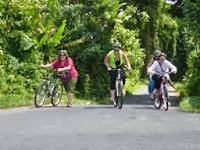 Bali cycling tour in the village sari tendril will visit attractions Sangeh monkey forest habitats inhabited by thousands of monkeys as well as the daily activities of the villagers-many of them farming way of gardening. shower, Change room, Towels & toilet.